You know when something inspires me... I suddenly become so incredibly absorbed and obsessed in a way I can only describe as finding your true love. Disney Pixar films have always had the ability to enchant me, right from the start, I’ve long been a Toy Story fan, and will always be fond of such amazing characters. I always get attached to the sweet nature of these films, and when I sat down and watched UP for the very first time, this warm feeling of love came rushing over me and I just knew this was going to be a good one. And from that moment on, I just had to track down a Grape Soda badge, just like the one Ellie owned, so I too could wear it with pride and treasure it amongst my most fond possessions. The search took me all over the world (via the World Wide Web) and I stumbled upon many a replica and home-made version, but it was this one that I set my heart on owning. Simply because it’s retro appeal had me right from the start. It came all the way from America, from this incredibly whimsical Etsy Shop. I am quite so taken by this little connection to such a wonderful little film. Cute! Don't you just love the internet for fulfilling your heart's desires? Oh I LOVED Up! I watched it by myself when I was on holiday and sobbed my heart out - good job no-one else was there to see! OMG! totally and definitely so cute!! i love the movie UP too! i just gotta have a nosey on the etsy link u share, thank you!! 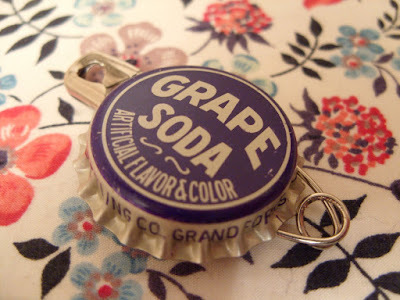 just love the grape soda badge!